On Saturday I took the 50 mile ride to Orpington to visit Cycles UK. The Cycles UK store in Orpington High Street was having a relaunch and my sponsor, Dare 2b were there with their international ambassador and 2006 Tour de France winner, Oscar Pereiro. I left home at 9am giving myself 4 hours to travel the 50 hilly miles. 4 hours was enough but apart from not feeling fast on the bike, there was the killer incline that is Yorks Hill. I'm sure it's well known as many have ridden up it according to Strava but I was totally unaware of its mahoosiveness until I was at the bottom. It's a climb that will forever be etched in my memory! 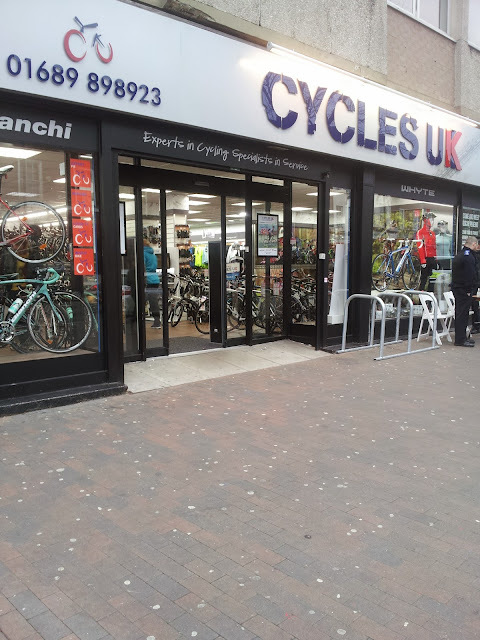 When arriving at the store, There were a couple of PCSOs stood outside and I thought they might be there to tell cyclists off. However, they were there to security mark peoples bikes so I had mine done. Cheers. Once inside the first thing I saw was a man standing in a bucket of water. Some may have thought he was just a bit gone in the head but in fact, he was demonstrating the waterproof socks from Sealskinz. Mick was very knowledgeable on the brand and the cycling market. Very impressive products if you've not seen them before. They make gloves and hats too. Not long after I met with the marketing team from Dare 2b and they introduced me to Oscar. He's a very likeable guy. I had my photo taken with him. After admiring the impressive collection of bikes and kit on display in store, I waited my turn to have a go at the 1km time trial on the virtual turbo trainer. I've never liked them as the feel is far from natural but such a short distance at full speed is enough to make your legs wobble when you get off the bike. Having posted a reasonable time of 1:18 I had a sit down and a glass of water. Whilst nosing around the store I got to talk to several of the staff. The store feels like a big chain like Evans but with the friendliness of your typical local bike shop. After mooching a little longer I got talking with the Whyte bikes representative. Again, very knowledgeable about his products and the market. Almost made me want to buy a full-susser there and then! After chatting with the friendly store staff and Oscar again it was time to leave. I rode the 10 miles over to East Croydon station and got the train home. A great day out. 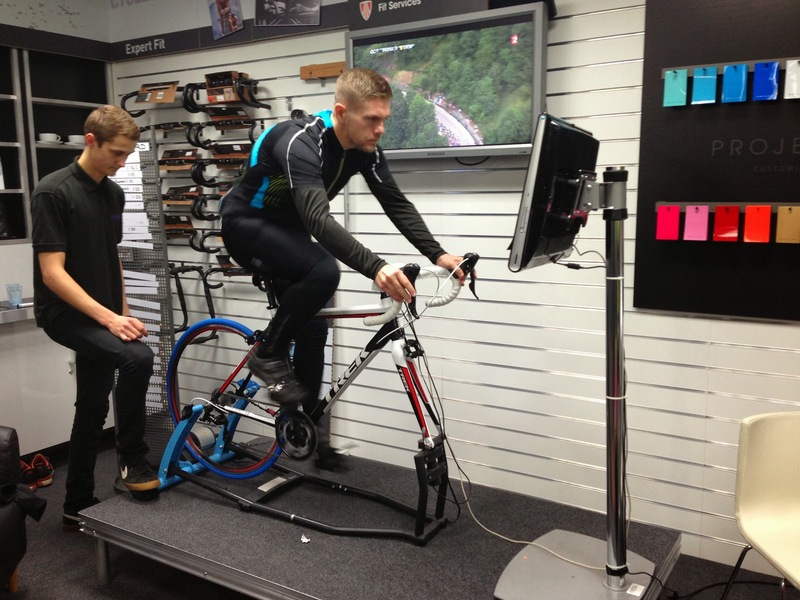 I can't believe you rode 50 miles to the shop and then went on the turbo trainer! How easy is it to take your bike on the train? I'm thinking about having a go at some of the hills in the Ride London in the spring - do you just turn up at the station with your bike? Taking the bike is simple, you just turn up. However you need to avoid to London in the morning rush hour and coming back in the evening rush hour. At these times you will not be allowed to put your bike on the train.